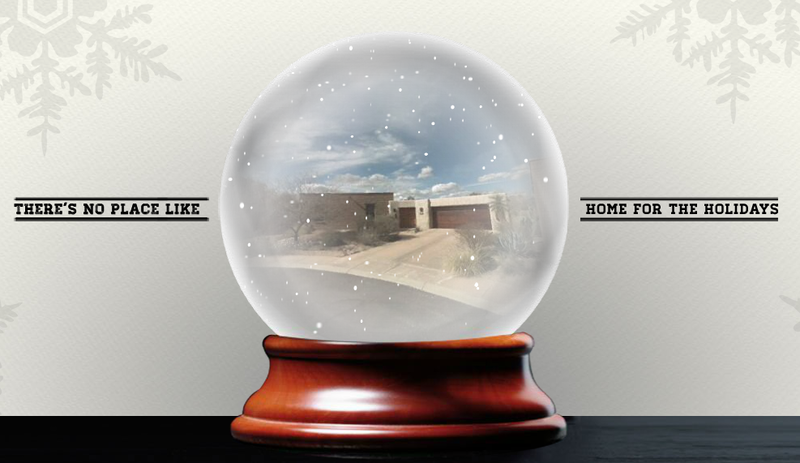 A rare snowstorm here at the house! This morning (Thursday, 22 December) a 500 mb closed low is over central Utah and moving toward southern Arizona. The 500 mb temperatures in its core are -30 to -35C, and Atmo's early WRF-GFS forecasts the 500 mb temperature to fall to nearly -30C over Tucson by morning tomorrow. The system will bring a deep, cold air mass across southern Arizona today, but with little precipitation, except in the White Mountains. The main brunt of the winter storm will be in Colorado and New Mexico. Graphic below shows the early WRF-GFS forecast for total precipitation through midnight tomorrow night. 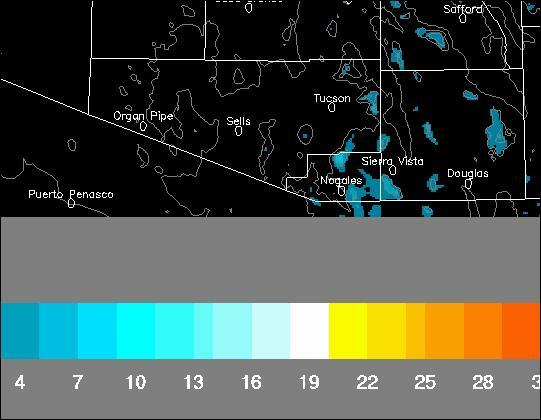 The WRF-GFS forecast of snow accumulation for the same period is shown above and indicates a bit of snow on the Catalinas, with better amounts over the Chiricahuas and Mt. Graham. The tabular forecast from the WRF-GFS (below) indicates coldest temperatures over the Tucson Metro area around sunrise tomorrow morning. The model keeps the temperatures warmer, and mostly above freezing in the city on Saturday morning. Once again a situation where low temperatures will be a difficult forecast and depend to some degree on the winds during the night. It seems that the Christmas light spectacle in Winterhaven (a neighborhood just south of our house) is a magnet for bringing in cold and rain to dampen the hay rides through the neighborhood. 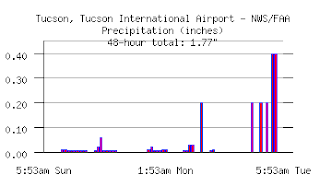 The NWS automatic weather station (ASOS) at the airport has gone bonkers. 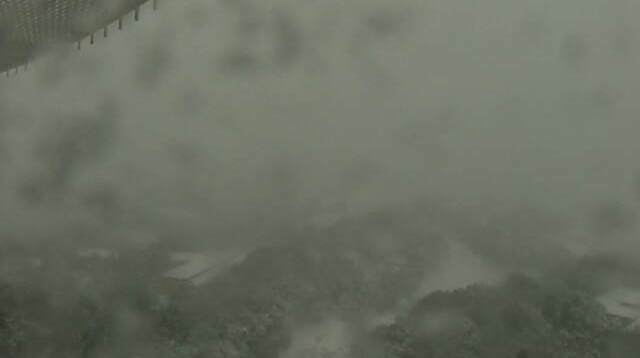 It is measuring heavy rain from a partly cloudy sky this morning - currently shows 48-hour total rainfall of 1.77 inches (above). Total at house ended up at 0.42" for past 48-hours. The precipitation event of yesterday afternoon and last night is winding down this morning (Monday, December 19th). My quick assessment of things at around 6 am MST is that the Atmo early WRF-GFS had the preferred QPF forecast - particularly with its forecast yesterday (see post below) of the event tending to focus north and east of downtown with a pronounce rainfall gradient across the lower elevations of eastern Pima County. Here at the house we had 0.39"; DM had 0.37"; Atmo had 0.22"; and TUS had 0.13". Looks like all forecasts for the airport were too optimistic. 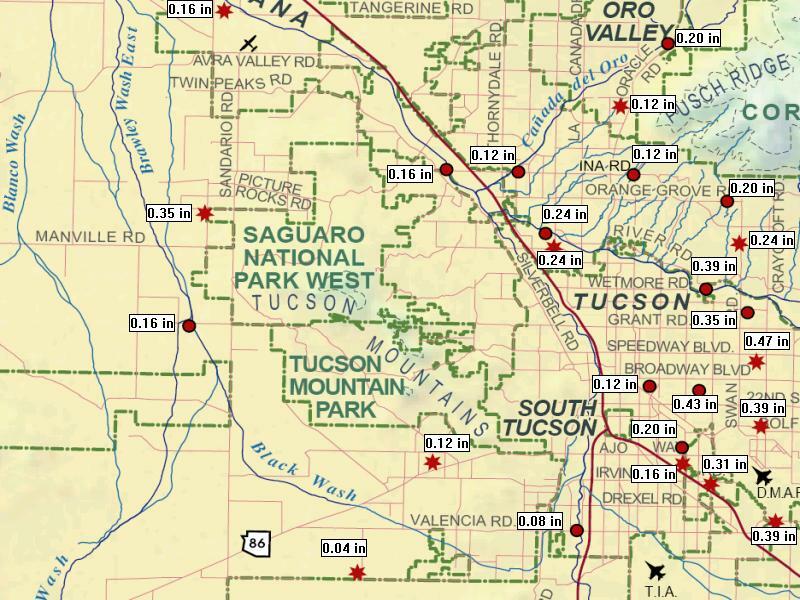 Shown above are the amounts from the Pima County ALERT network for central and western parts of the area - note the range from 0.04" at a southwest station to the 0.47 at an eastern station. 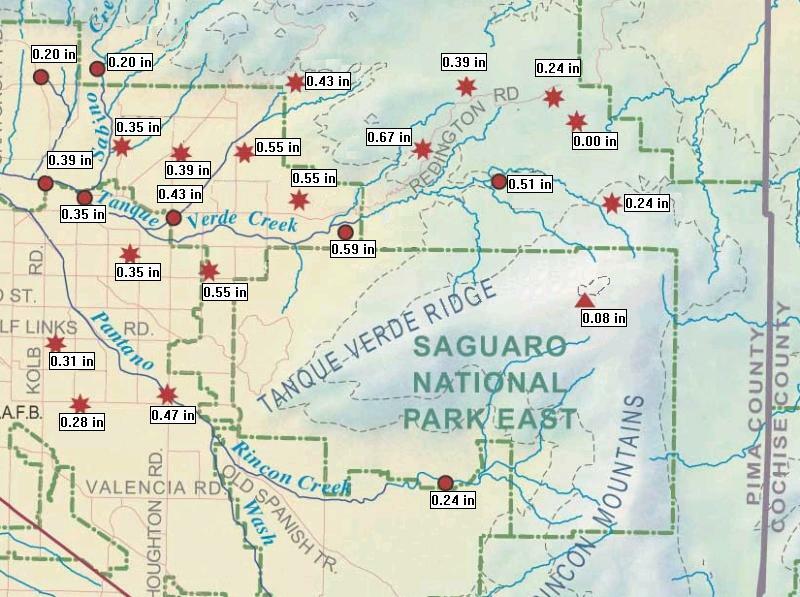 Plot below is for eastern part of the ALERT network - note the highest amounts are in the Redington Pass area, with a maximum amunt of 0.67. Snowfall amounts are not measured by the network, so what exactly fell at higher elevations is currently an unknown for me. The total here at the house for December currently stands at 2.38". This makes the month the second wettest December of the 12 years for which I have December observations. Four of these years had less than 0.10" for the month and four years had over an inch. The wettest December at house occurred in 2007, when the precipitation total was 3.23". 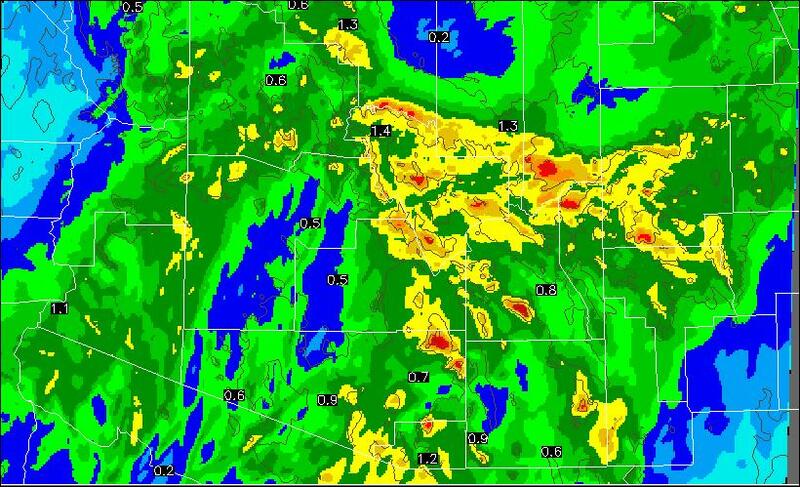 As the current storm system begins to approach from the west, the key question remains that of how much rain or snow will fall across southeastern Arizona. This is referred to as QPF (Quantitative Precipitation Forecast - how much precipitation, when and where). This type of forecast remains very difficult even at short time frames because so many small-scale factors affect the final outcome - for example, the details of terrain, development of deep convection, etc. While it is very easy to visit the NWS web site and find that the probability of rainfall at the airport is 90% today and 100% tonight, it is much more difficult to find what the official QPF currently is for the airport. Digging deep into the page, and after much work, I find that the NWS forecast for the 1 km grid box that includes the airport is that 0.43 inches of rain is expected to fall through noon tomorrow. 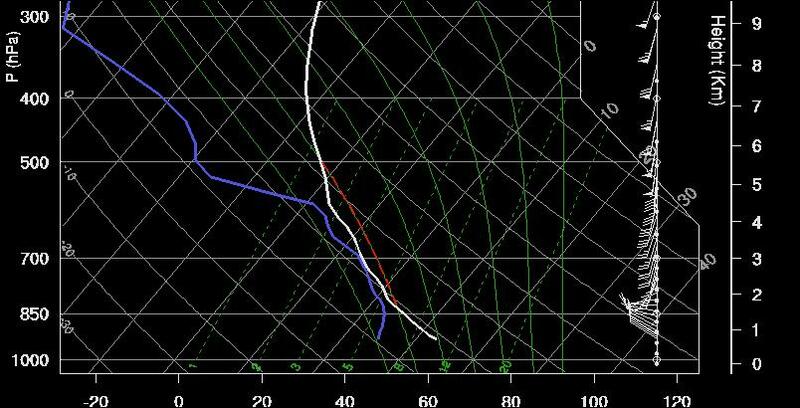 The above 500 mb chart is the morning NAM forecast valid at midnight tonight. The model forecasts the strongest vorticity advection at 500 mb to remain south of the border. 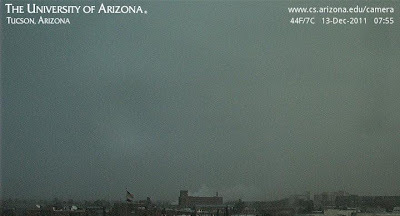 Temperatures observed in the closed low are below -25C this morning, indicating that mid-level temperatures in southeastern Arizona will fall abruptly during the coming 18 hours (500 mb T over Tucson at sounding time this morning was -17C). There are many pros and cons at play with this system. No distinct southerly feed of moisture has developed and the system has been carrying sparse moisture within it's circulation. 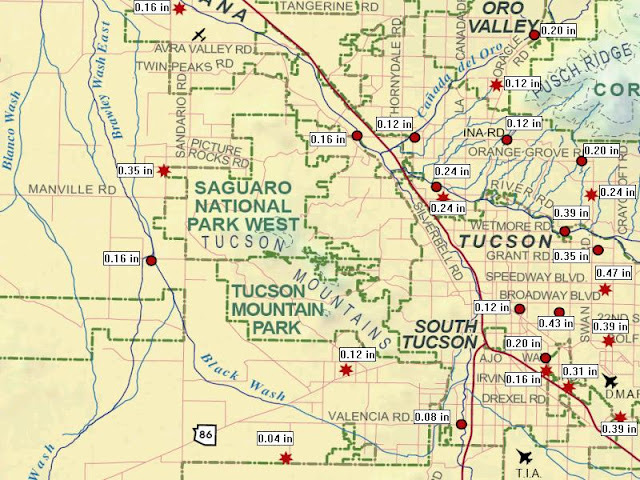 Although low-level moisture is higher to the south and east of Tucson, the forecasts by the models never bring this moisture across the divide. So, the storm's vertical motion will develop what precipitation it can, as it works on somewhat dry air. The models do have a substantial northern offset for the 700 mb low, and it tracks right across the White Mountains, so that is somewhat favorable. 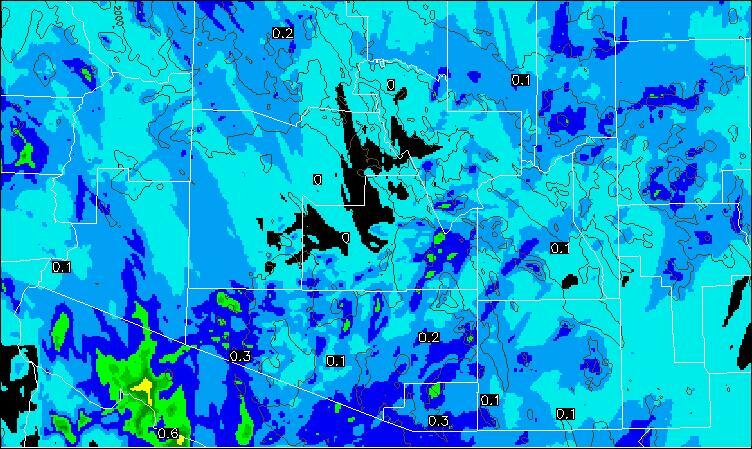 The morning NAM QPF through noon tomorrow (above) indicates 0.10 to 0.25" possible for Tucson and surrounding area. 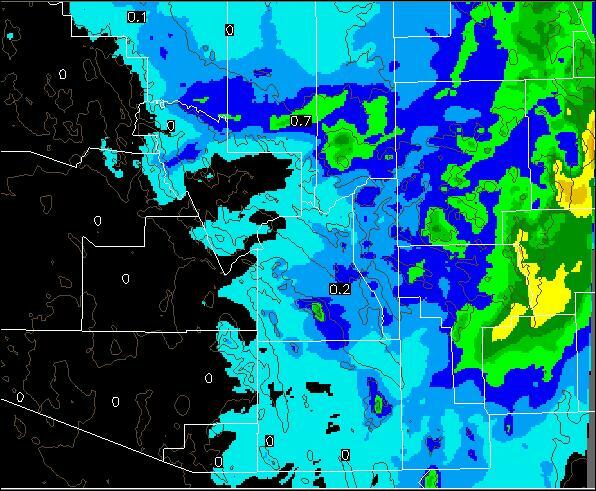 The midnight QPF forecast from the Atmo early run of its WRF-GFS, below, shifts the focus of the event into Tucson metro and both the Catalinas and the Rincons - very much different than the NAM. Finally, the WRF forecasted sounding for Tucson at 3 pm this afternoon (below) indicates that deep, moist convection will be possible for a few hours - complicating the entire QPF situation. So, there are many complicated factors at play - now to observe how all of this interacts and works out. The occurrence of these Kelvin-Helmholtz waves was noted on the Albany MAP chatboard this morning. The waves occurred the morning of 16 December, 2011 (yesterday), and were photographed here from the Birmingham, Alabama, airport. There are more photos and a video at: http://www.alabamawx.com/?p=55225 The waves formed on the top of a very low stratus or fog layer, providing this spectacular perspective. Edited to add an old Air Force memory: The airplane in the left foreground is a USAF KC-135, most of which were fuel tankers; some of these had been retrofitted to carry passengers but with no windows added. In the spring of 1974 I was assigned an extra duty day as the Strategic Air Command top secret courier (hardly a fitting duty for a weather forecaster). This meant I spent a stormy, very bumpy day in one of these KC-135s carrying "important" stuff to and from every SAC base in the northeast U.S. Not fun for someone who was nervous about flying, even when I could see what was going by outside. As an added bonus, I was accompanied by a bodyguard - a sergeant carrying a huge pistol of some kind. My task was to keep hold of the sealed bags of secret stuff no matter what. Needless-to-say, this was an experience I'll never forget. 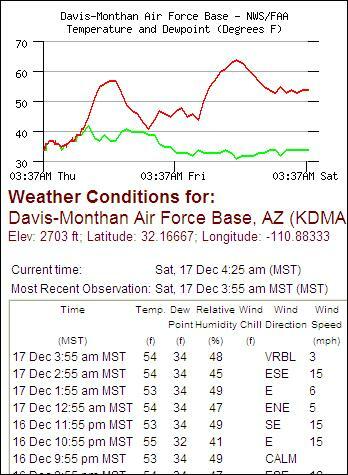 The plot above shows surface conditions across southeast Arizona at 4 am MST this early morning. Note that temperatures are again much warmer than forecast and are about 10F warmer than 24 to 30 hours ago - all of this for the second consecutive morning. Coolest readings are at the highest elevations, but I don't see any reports of temperatures at or below freezing. Here at the house the wind has blown all night, and the current temperature of 52F is also the low temperature so far - 20F warmer than yesterday morning's low! 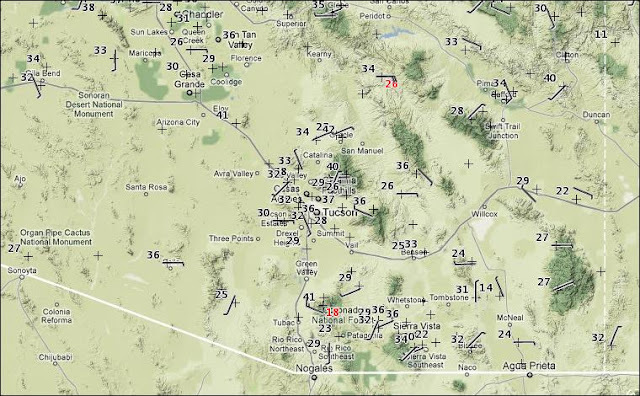 Winds are highly variable, but with highest gusts (numbers in red) at highest elevations - note 61 mph gusts on Mt. Hopkins (from the RAWS station there). 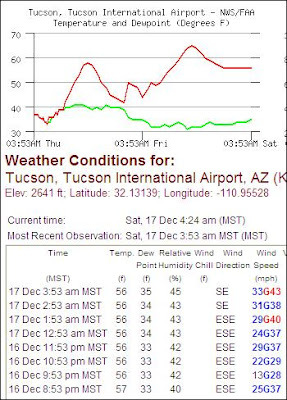 The ASOS at Tucson International Airport was reporting gusts to 43 mph - the TUS wind reports are so different than surrounding stations that one has to wonder if the data are accurate (winds on the roof at Atmo are only gusting 15 to 20 mph). I assume the data are good, since they have been consistent through the night. Time series for TUS and DM are shown below for the hours since last evening. 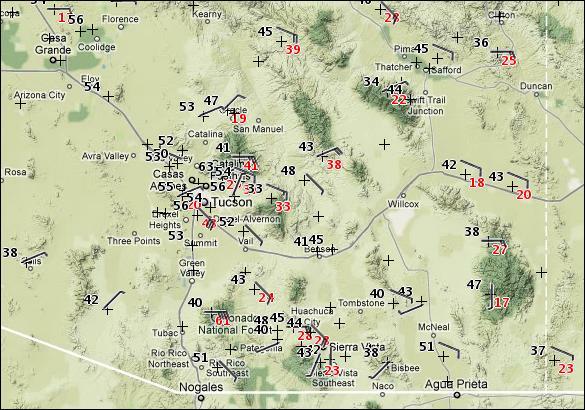 Although they are only a few km apart, the winds at DM have not exceeded 15 mph. Temperatures have been similar through the night at both sites - very mild. The time series plots of temperature illustrate the marked warm-up of the early morning temperatures during the last three days. Finally, data from the RAWS station on Mt. Hopkins are shown below (note that 11:19 GMT is 4:19 am MST). The winds at this site (which is often very windy during deep easterly flow - perhaps due to local effects related to the higher Mt. Wrightson just to the northeast) have been blowing at speeds of 45 to 50 mph with gusts 60 mph and above - highest so far has been 64 mph. What a difference a day can make. First, a bit about the warmer temperatures that occurred last night. 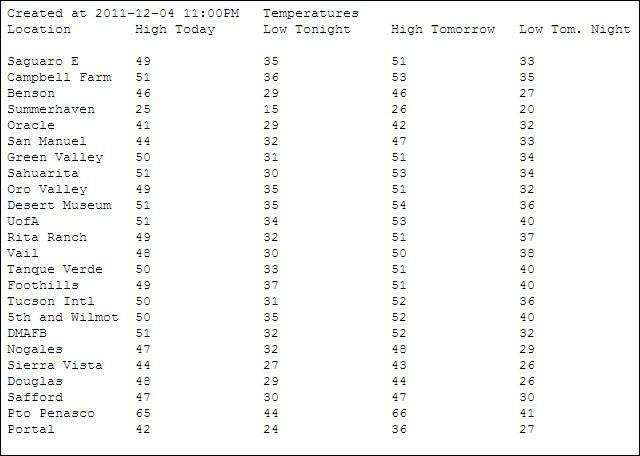 Overnight lows at many places in the metro were 10 degrees or so warmer than on Wednesday night. The Atmo WRF forecasts yesterday caught this warming quite accurately, as they brought in east winds during the night. At TUS and DM winds kicked in just after midnight, so that the lowest "morning" temperatures were at midnight, with temperatures jumping around before dawn and even going into the low 50s at times. Dewpoint temperatures plunged during the night, and, combined with the wind, meant there was no chance for a repeat of the heavy fog that occurred yesterday morning. Here at the house the morning low was 32F (28F with fog yesterday), and there is still a light frost on the roofs. The WRF forecasts stronger winds tonight, so we'll see if winds can keep the Rillito bottoms warm. Finally, the sun-tinted cumulus clouds in the view of the Catalinas (above) are scooting along quite rapidly on strong east-southeast winds, indicating a gusty day likely on tap. I'm taking a look at the model forecasts made from the 0600 UTC data last night in this post, since the influence of the models' terrain resolution is nicely reflected in the various precipitation forecasts. The current 500 mb closed low malingers near northern Baja until it moves eastward across southern Arizona on Sunday. Above are the GFS (operational member) and NAM forecasts for total precipitation for the period ending at midnight Sunday night. The GFS (top), with its crude terrain resolution, focuses the weekend precipitation over the northeast third of the state with lesser amounts in the broad upslope (in the model) areas of the southeast and west. The GFS forecasts significant precipitation across the Navajo and Hopi Nations and the Little Colorado Basin, which is an area of downslope and minimized precipitation in most events. The GFS also forecasts up to a half inch of rain for the low elevation, metro Tucson area. In contrast, the NAM (upper bottom), with its higher terrain resolution, forecasts little precipitation in the southeast part of Arizona and focuses the event along the upslope regions of central and northwest Arizona. 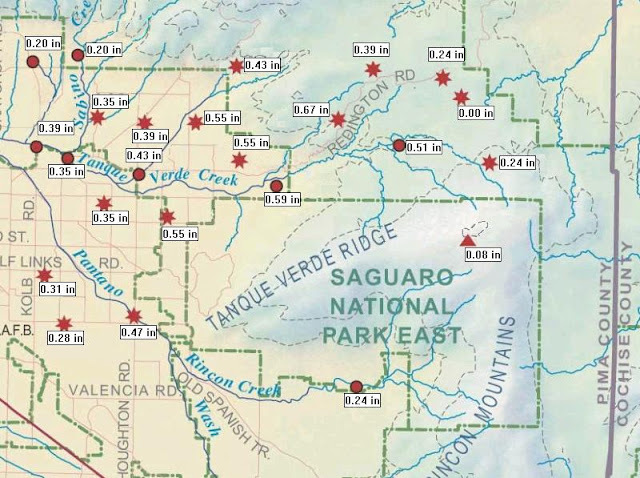 The NAM forecasts a minimum of precipitation over the Little Colorado Basin and also along the main-stem Colorado River canyons. The NAM also forecasts a more significant storm for the mountains of northern Baja. Finally, a look at Atmo's very high resolution WRF-GFS precipitation forecast - above, and for the same period. The main feature of interest in the WRF forecast is that heavier amounts are forecast in the upslope areas along and south of the border (quite different than the NWS operational models), while amounts at higher elevations are a mixed bag over southeast Arizona. Heaviest amounts are at the northern end of the GoC in the el Pinacate upslope region - indicating that low-level moisture from the GoC comes into play in the WRF forecast. The snow accumulation from the WRF is shown below - the model forecasts largest snow accumulations for this event to occur over the mountains to the south and southeast of Tucson and does little on the Catalinas. So, the details of each model's forecast are quite different, and it will be interesting to observe how things evolve during this next weather event. I admit to having a preference for the Atmo WRF and would predict that it will win the weekend contest of the models here in southeast Arizona. 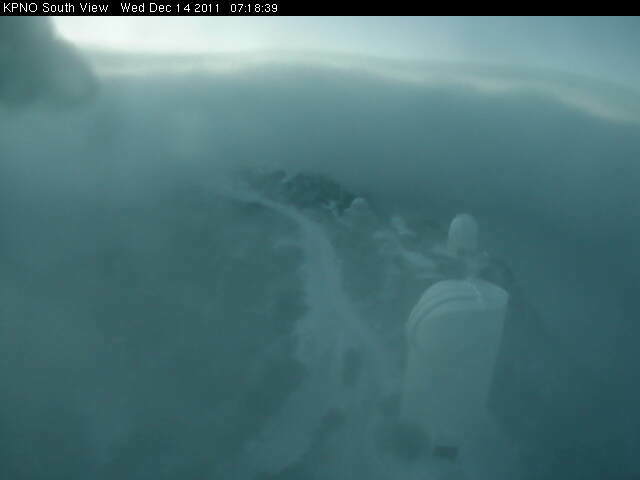 Above photo is from Kitt Peak webcam - south view, at a bit after 7 am MST - shows a frosty, foggy ghost-like scene. 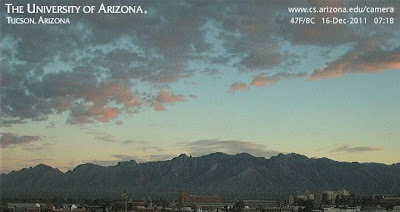 View below from a bit ago shows snow on Catalinas and that snow level didn't change much after late morning yesterday. Rainfall here at the house was 1.26" on Tuesday - and 0.26" Monday morning. Putting past two days in a near tie with September 9 and 10 as wettest 48-hours during 2011. December total now stands at 1.99" here at the house - really quite something. Above is a shot I took around 9 am this morning during a brief break in the rain. It looked like the snow level had come down to 5500 ft or so at that time. Light rain continues this afternoon and total in gauge here is now over an inch - making this event the largest since the heavy thunderstorms of September 10th. 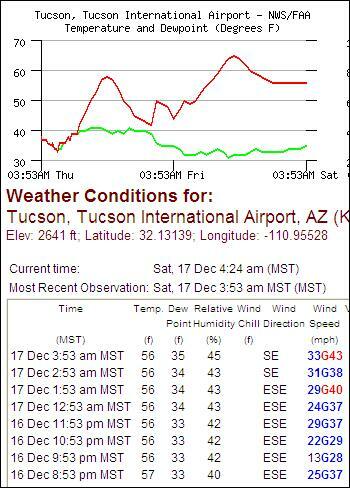 Temperature here has gradually fallen and is now at 41F. I went out around 11:30 and the streets in this part of town were flowing like little rivers - especially Grant, Tucson, and Country Club. Yesterday morning I measured 0.26" here at house between 9 am and noon, after the first band of showers had passed. Then there was only a trace from noon yesterday through 5 am MST this morning. But a heavier and more persistent band of showers moved in just after 5 am. 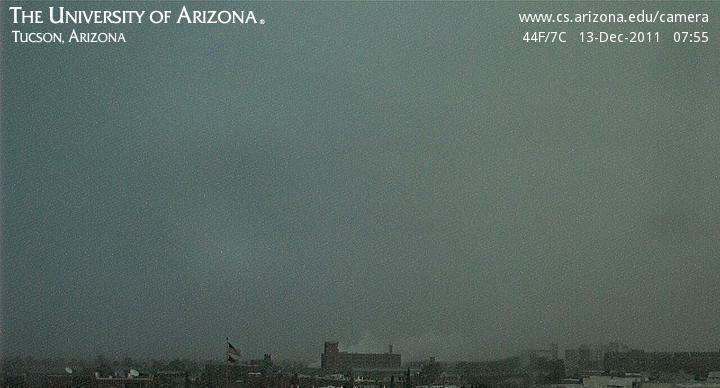 Current view from campus looking toward north is above. Current view from Kitt Peak looking north (below) shows that precipitation is now snow there (elevation 6880 ft MSL). Since rain started again this morning, an additional ~0.40" has fallen here at the house. 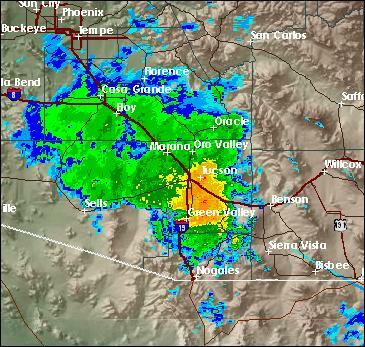 Image at the bottom is current KEMX composite radar image, showing a significant area of moderate rain over the Tucson metro area. Good day to stay in and read a book! But, alas, it is Finals week at U of A, and the students have to slog-in through this mess for exams. There may be a lot of reports of dying uncles and grandparents providing excuses for the students not brave enough to venture out today. 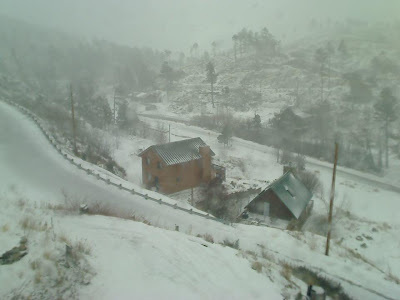 Webcam view near Summerhaven on Mt. 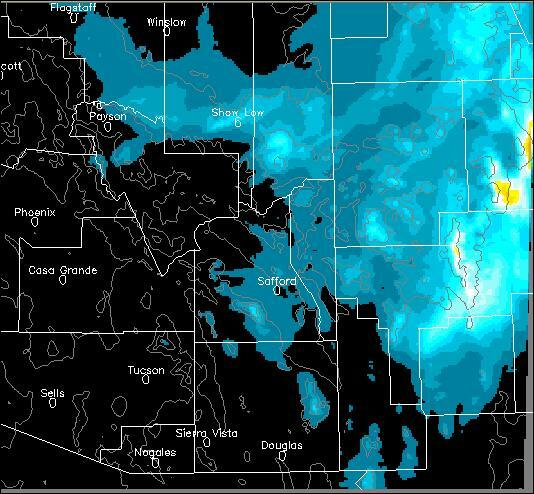 Lemmon shows that light snow is falling up there at 8 am MST.. Here at house there is heavy cloud cover with some mammatus and light sprinkles. 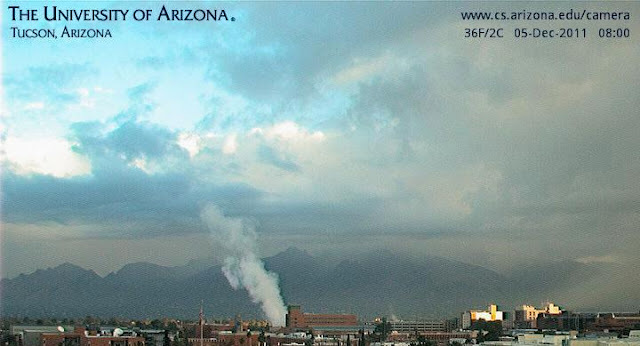 View of Catainas from campus is shown below. 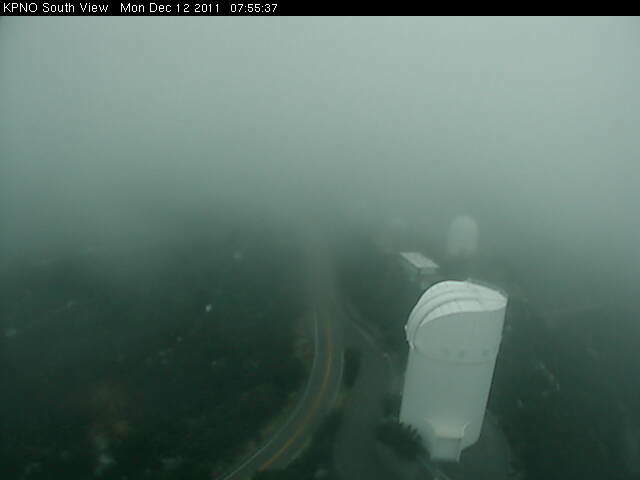 Kitt Peak is in the clouds, as seen in bottom webcam image. No rain into the area as of 6 am MST this Monday morning, except perhaps some sprinkles from the high, thick overcast. After 8 days of morning lows in the 20s, temps early this morning at house are in the low 40s. Models continue to forecast a significant precipitation event for Arizona from this afternoon into early Wednesday. The early run of the Atmo version of the WRF-GFS forecasts a very significant event, especially for the mountains. At top is the WRF-GFS forecast through noon Tuesday of total precipitation. Middle is the amount color bar. Bottom is total precipitation forecast though 6 am Wednesday morning. 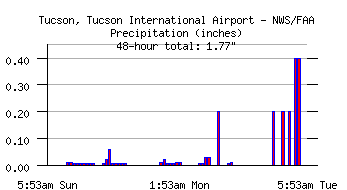 Amounts in Tucson metro area range up to around an inch and a half. Highest elevations are forecast to receive 2 to 3 inches of water equivalent precipitation. Model forecasted snowfall through noon Wednesday is shown below - yellow indicates forecast amounts of 20" inches and darkest red tones indicate more than 3 feet. The next storm system that will affect the Southwest has the potential to bring a significant rainfall episode to low elevations, as well a dangerous winter storm to higher elevations. 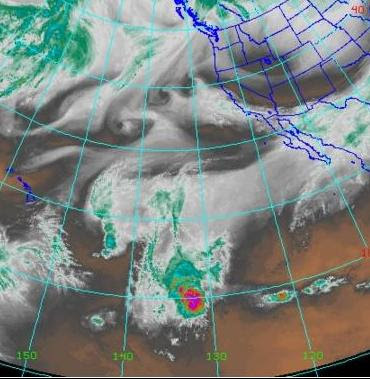 The 2100 UTC water vapor image (above) indicates enhanced moisture west and southwest of Baja, while the next short-wave trough is digging southward off the northwest US coast. The moisture intrusion that is developing has had its origins both east of Hawaii and also with the large convective region that occurred the last few days around 130 W - see an earlier post. 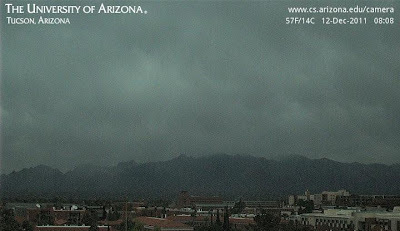 The interaction between the deepening short-wave and moisture from low latitudes will lead to an early development of precipitation across southern Arizona - likely sooner than indicated by some of the forecast models. The 36-hour NAM (from 1200 UTC run this morning - below) for 500 mb indicates a closed cyclone west of the LA Basin at 5 pm MST tomorrow. The forecast cyclone is being strengthened by vorticity advection into the bottom of the circulation from the long vorticity streamer that curves all the way back into southwestern Canada. Current model thickness forecasts indicate that precipitation in the lower elevations will remain rain, with heavy snowfall in the mountains. 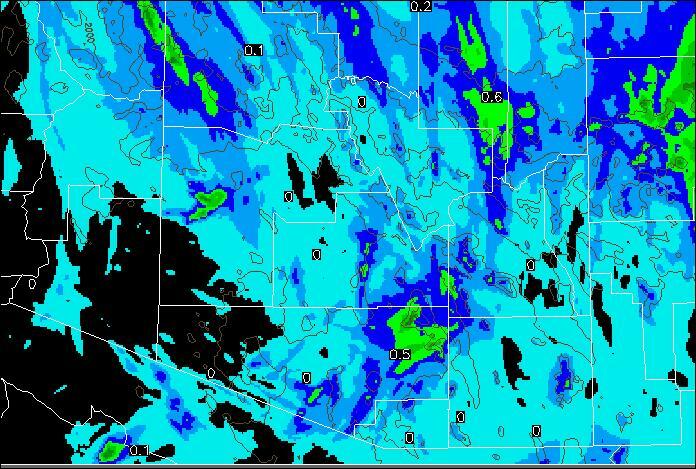 The NAM forecast for total precipitation through 5 pm MST Wednesday afternoon is shown above - amounts are very substantial, especially for the eastern Arizona mountains. The GFS forecast for the same period (below) does not have such extreme amounts, but has forecast amounts of 0.75 to around 2 inches over a large portion of Arizona. The GFS ensemble forecast from 12 UTC this morning has all members forecasting significant precipitation for southeastern Arizona for the four consecutive 12-hour periods that begin at 5 am tomorrow! I can't recall a forecast quite like this since I've been watching the ensembles. It appears that this will be a very significant storm, and all who will be driving, or outside, at higher elevations (5 to 6 thousand feet and up) during the next couple of days should use caution as this storm unfolds. It looks like another cyclone in the southern branch of the 500 mb westerlies will move across the Southwest during early to mid-week next week. See ECMWF 500 mb forecast above valid at 5 pm Tuesday afternoon. The NWS GFS 500 mb (from 00 UTC last evening) ensemble forecast average and spaghetti plot, valid at the same time, are shown below. The mean trough over the West is somewhat similar to the ECMWF; however, the most spread in the model forecasts (spaghetti plot at right) extends from the Great Lakes Region to all of the West coast - so, details and timing are different in the various members. 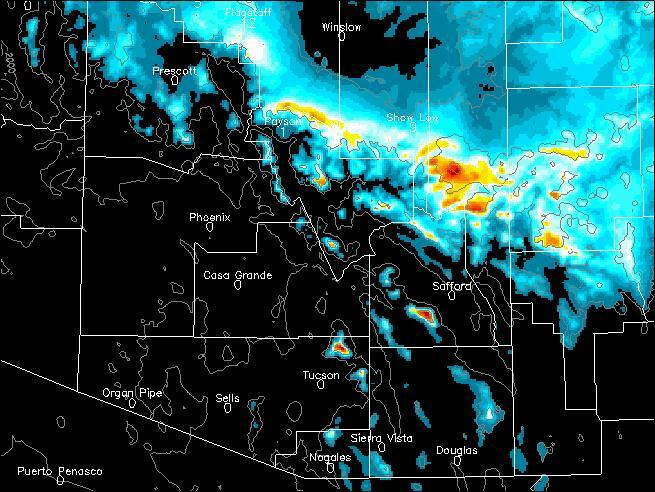 All members tend toward a widespread precipitation event, with significant snows in the east-central mountains of Arizona. Will be interesting to observe how this next weather event evolves. Interesting convection at about 10 degrees north. A very large convective system has been moving to the east across the Pacific (WV image above is from 13 UTC yesterday and image below is from 10 UTC this morning) and is now approaching 130 W. I won't attempt a guess at what exactly is forcing this event, ut comment most welcome. Note also the three, upper-tropospheric, waves strung out to the west of northern California. The eastern Pacific appears to be very "busy." 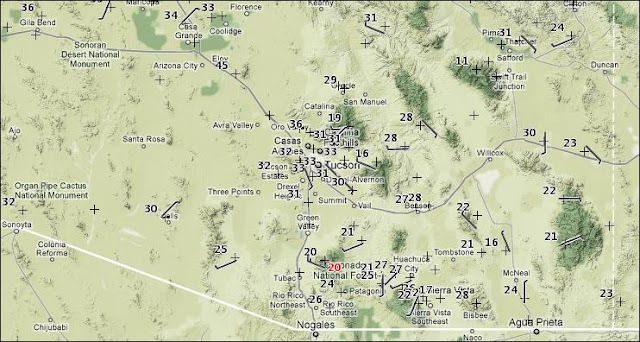 Another cold morning in southeast Arizona with temperatures from teens into 40s at 7 am (below - note that red numbers are dewpoints), with Organ Pipe out west at 27F. Some snow still lingers in the shadows at Kitt Peak (above). Here at the house it is our third consecutive morning with a low of 20F (5th morning in a row with lows in the 20s), accompanied by heavy frost. Some of the plants in the yard are cearly suffering. Other lows: Sasabe 21F and Empire 23F, but the mountain top RAWS stations are now warmer than some of the lower elevations, with lows of 39F at Mt. Hopkins, 32F up on the Rincons, and 23F on Mt. Graham. I've been reading and studying the Rosemont Mine draft Environmental Impact Statement this morning and did not get around to looking at weather until now. Low this morning here at house was 20F, with heavy frost for second morning in a row. So last three mornings have gone: 28F, 24F, and 20F. The "official" TUS lows for the same days were: 35F, 31F, and 28F. At 11 am MST the top of the shaded, adobe wall in our small courtyard still is covered with heavy frost. More on Rosemont in a later post. Answer to question in Comment - I think it is La Canada Wash, but two large washes come together right in that area. 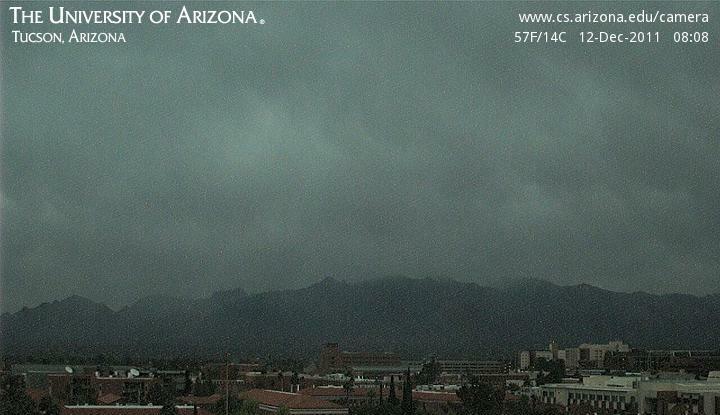 There have been frequent snow showers over and near the Catalinas this morning - as per 8 am MST view from campus. 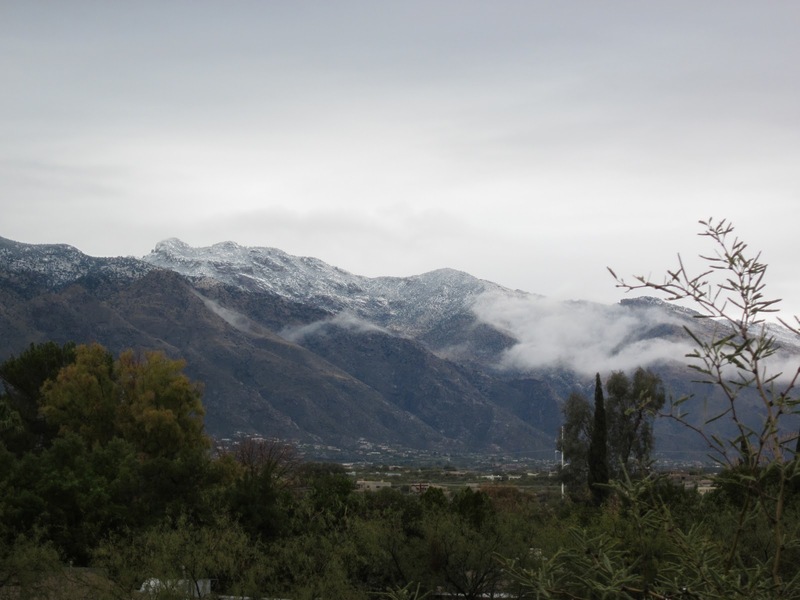 Ron Holle reports: We had about a quarter inch of snow grains in Oro Valley this morning. Another cold morning here at house with temperatures in the 20s again this morning. 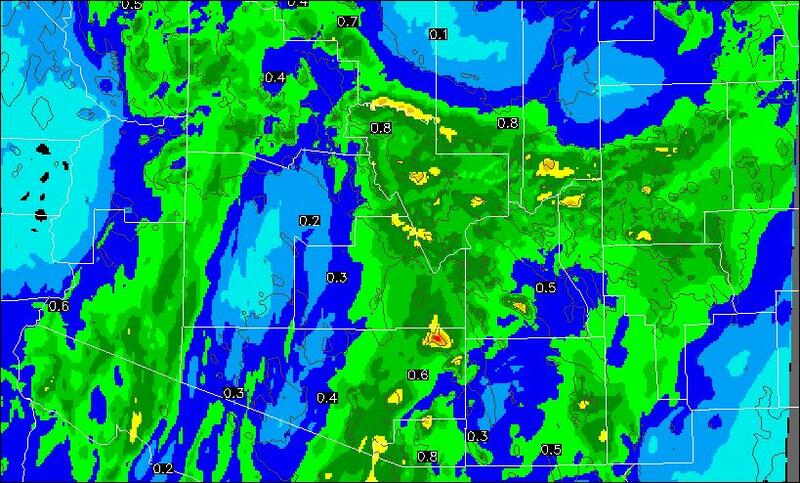 The 6 am MST surface plot across the metro Tucson area is shown above. 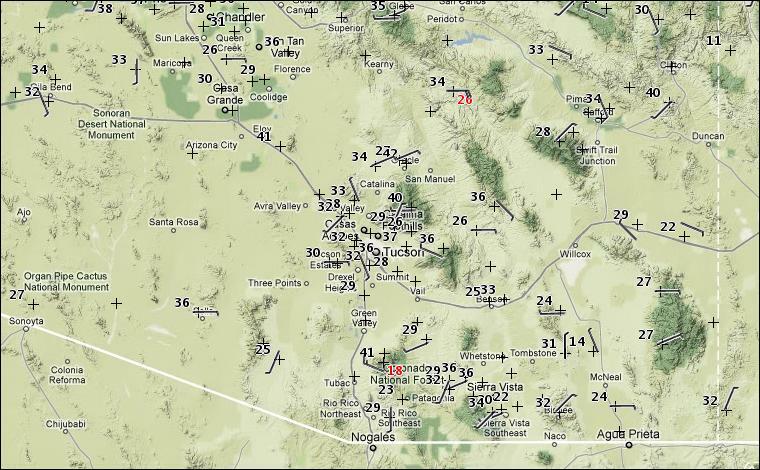 I note that it's 32F out west at Organ Pipe and down to 21F at the Empire Raws. Temps here at house are often very close to the Empire temperatures, even though the elevation out there is over 2000 ft higher than here. The concurrent IR satellite image (below) shows a swath of cloud overhead before sunrise (note that TUS ASOS observation is clear since the automatic station does not detect clouds above 12000 ft). The clouds have let temperatures moderate a bit during last hour or two - at 6 am here at the house it was 28F but earlier in night it had been down to a low of 24F. The early run of the Atmo WRF-GFS model forecasts two more chilly days and cold nights for the local area - see above table for today through tomorrow night. Finally, a 6 am surface plot for much of the Southwest is shown below. There are single digit temps in northeast Colorado. A snowstorm is underway over the eastern 2/3rds of New Mexico, with snow on both sides of the Front Range and in the northern Rio Grande Valley. Brrrr.